Obituary for Marian G. (Ganey) Keith | Donaldson Funeral Home of Clarksville, P.A. 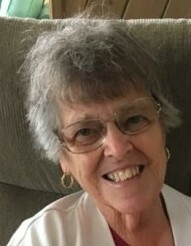 Marian G. Keith, 86 of Salisbury, MD. died on Sunday, January 20, 2019, peacefully at her home. Born on November 22, 1932 in Washington, D.C., she was the daughter of the late Lee and Inez Banta Ganey. Marian was involved with Girl Scouts of America, volunteered at her children's schools, participated in the sewing ministry for Christ United Methodist Church, the "attic Artists" painting group and attended MAC Center exercise classes. Marian is survived by three daughters; Carol Ann (Steve) Adkins, Mary L. (Dan) Anderson and Patricia L. Gatto; two grandsons; Tony Gatto and Michael McGuigan; seven granddaughters; Kelly McGuigan, Hailee (Wesley) White, Emily (Ben) Basham, Lindsey (Clark) Scott, Alicia Kelch, Sarah (Luke) Batchelor, Stephanie Kelch; three great-granddaughters, Sophie Webb, Rohlyn Smith, Charlotte Basham; three great grandsons; Eliot White, Hudson Basham, Caleb Batchelor; two brothers; Alan and William Ganey; sister; Bonnie Kessler; step-daughter; Jeanne Keith. Marian is preceded in death by her loving husband, Chasie B. Keith; daughter, Susan M. McGuigan; father. Lee Ganey; mother Inez Ganey; brothers, Robert and Lee Ganey; sisters, Frances Farren and Inez Ganey. Friends and relatives are invited to join the Keith family for a gathering and memorial service on Friday, January 25, 2019 at 2:00 p.m. at the Donaldson Funeral Home of Clarksville, P.A. 12540 Clarksville Pike, Clarksville, Maryland 21029.